Still one of my most loved albums. And a recap makes me conclude that it stands the test of time even better. Fresh, crisp and moody after all these years. A masterpiece. As a means of describing the term "IDM", there is likely no example more firmly rooted in the style. Translated as "Multi-level", this music is lavish in its sparseness; crystalline textures hanging like early mist under serrated rhythmic tessellations and electronic flotsam and jetsam. 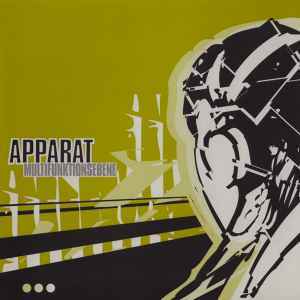 Apparat's thoughfulness is evident in his music; nothing is out of place. There is an economy of expression in these cold, stark soundscapes that is gorgeously minimal and utterly enchanting. Music that coexists in this same expanse of "structured reverie"--intelligent trance music?--would include Arovane, Boards of Canada, Loscil, Autechre, and Monolake. The 'Apparat' (German for 'apparatus') belongs to the Berliner Sascha Ring. It's a mathematic device to produce musical structures. Random modulation algorithms manipulate audiodata in varying intervals. The boundery conditions have been given though, like with Mozart's musical dice game. Thus the chaos that develops still forms an organic world, which might remind you of a jungle, where in the chirring of insects, the chirping, the knocking and dropping, there seems to be an inscrutable logic. This intellectual, interdisciplinary form of production is embedded in sedate sounds of a cosmos, which is also homey to the early works of Future Sound of London, the electronic output of a Bernd Friedmann (A-Musik) or the urban melancholy of Bohren & Der Club Of Gore. The breaking of rhythmical structures, and those reflective moods that seem to arise by chance, had once again recommended Shitkatapult as a source of acoustic research at the time of this release. A curious listener will be rewarded!